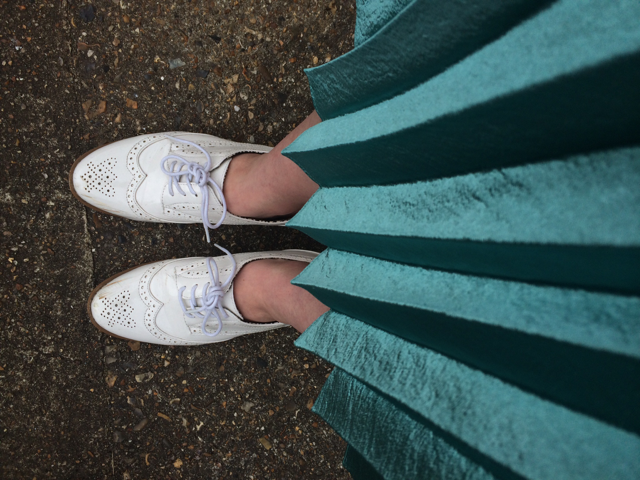 I wore my newish white patent brogues to work, which I should point out were a complete bargain, and received some good reactions. I decided why not blog about it. Here’s what happened. They got scuffed, massively. Not only by the train but by the opposite foot. I blame my Bambi-like ankles for this. I got asked if I was a golfer. I’m not but can demonstrate a good swing technique thanks to years of listening to my dad and lil brother, both keen golfers. Someone asked if my feet got sweaty as they noticed I wasn’t wearing socks. They didn’t but I informed them that they probably did smell. The made me do a double take every time I looked in the full-length mirror in the ladies loo at work as they’re so bright. This made me wonder whether I’d be able to see my face in them. I skidded my way through Victoria station as they have zero grip on the soles. So there you have it. The inane thoughts and comments around my beautiful new golf shoes, I mean brogues. Find out what happened The Day I Wore Sparkly Shoes to Work.